Goat Heads, puncturevine, Tribulus terrestris, #$^$*# thorn! – whatever you call it, goat heads are a problem for cyclists. The non-native weed pierces regular tires with ease, and sometimes go through even tire liners, and extra tough tires. They occasionally defeat tire sealant too. Cycling Utah is calling for the weed to be placed on the Utah State Noxious Weed list for 2015 as a Class B or Class A Noxious Weed. They are a pain for experienced cyclists, but also create a barrier to cycling for the new or occasional cyclist. 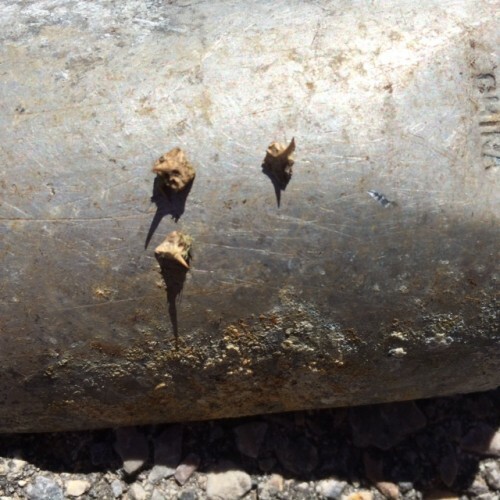 Who wants to take their family or date out for a ride on their Jordan River Parkway, valley mountain bike trail, or other puncturevine hot spot only to come back with a flat? Experienced cyclists will have methods for defeating Goat Heads and can change a tire with ease. Less experienced cyclists, those that transportation planners are focusing on, need to have conditions be safe and convenient so that cycling becomes the norm, rather than the alternative mode of transportation. If a family of four that is learning to ride gets 4 flats on their bikes, this could cost them $40 to get back on the road again. This is clearly an impediment to increasing bicycle ridership and getting people out of their cars. In a recent conversation I had with one of the industry's largest companies, they noted that the inexperienced cyclist often doesn't want to deal with adding air to the tires once a month, much less fix a flat. In Utah, the Jordan River Parkway has sections that are plagued by Goat Heads. In the last few years, they have made huge strides towards keeping the weed under control through weed pulls, spraying, and weevil biocontrol. From all accounts, it's making a difference. But Goat Heads are tough weeds – the seeds can remain viable sometimes for up to 20 years! They thrive in dry bare ground, the ground that is often found at the edge of bike paths and trails. A single plant can produce 200-5000 seeds in a season. In Washington County, according to Mitch Curwen of Red Rock Bicycle, bike shops in general purchase more thorn resistant tires, tubes, and sealant than anywhere else in the country. This is clearly a detriment to cycling in the region. He related that another bike shop in the area has an example tire that picked up 300 goat heads! On his commute, he uses puncture resistant tires and tubes, and still carries three extra tubes to avoid having to walk home. The weed is currently not on Washington County's noxious weed list. According to Washington County Weed Supervisor Dale Gubler, they don't intend to add it to the county's noxious weed list because it is so prevalent. Puncturevine seeds can stay viable for up to 20 years. In Moab, they are somewhat of a problem in town, but not on the trails, according to Poison Spider Bicycles. It's time to declare war on Goat Heads! Utah needs to add Goat Heads to the official Utah State Noxious Weed list (http://le.utah.gov/UtahCode/section.jsp?code=4-17 and http://www.rules.utah.gov/publicat/code/r068/r068-009.htm). While this won't help change the biology of the weed, it would help by making it the responsibility of property owners to clean up goat head infestations. And, it would make it illegal to disseminate the weed through unclean agricultural machines, seed, or livestock feed. It would require County Weed Boards to report each year on progress in controlling the weed. Utah's noxious weed list is supposed to be updated each year. Goat Heads should be added as a Class A or B weed. From Utah State Code, “Noxious weed means any plant the commissioner determines to be especially injurious to public health, crops, livestock, land, or other property.” Goat Heads clearly fit these criteria. If it is added as a Class A or B weed, it would become a priority for control. This will require changing administrative rules R68. Agriculture and Food, Plant Industry. Rule R68-9. Utah Noxious Weed Act to add Goat Heads to the noxious weed list. This needs to be done by the Commissioner of Agriculture and Food, or their representative. Goat Heads are an annoyance for cyclists. Cycling Utah will send this editorial to them to see if they will add the invasive weed to the list for 2015. We will update you if you we hear back. Currently, Goat Heads are listed as an invasive weed for Salt Lake County. But, they are only a class C weed, which means that Salt Lake County will educate property owners about the weed and ask them to clean it up, but won't ticket them if they don't. We believe that it should be elevated to a Class A or B weed in Salt Lake County so that stronger measures will be taken to clean it up. 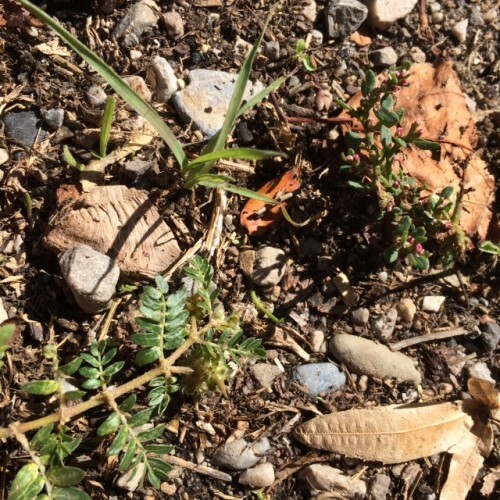 Adding Puncturevine to the Utah State Noxious Weed List will make conditions better for all cyclists, from racers to commuters to recreational cyclists, and will result in more people riding and enjoying the roads and trails of Utah. Place in the trash any Puncturevine seeds or burrs that get stuck in your tires, shoes, feet, etc. Pull any plants that you see and throw them away. You can dig them up to pull up the tap root too. Spray large infestations with herbicide (for a list, see http://slco.org/weeds/pdf/Puncturvine.pdf). This should be approached with caution, and as a last resort, since herbicides are toxic to you and the environment. Plant native plants, grasses, or ground cover in areas that have Puncturevine. Puncturevine establishes in barren ground, but is easily outcompeted by other plants with proper landscaping. In Washington County, contact SUBA (https://www.facebook.com/SouthernUtahBicycleAlliance) to participate in a weed pull. Use puncture resistant tubes, tires, and sealant where necessary. Update: The Utah State Noxious Weed Committee will be considering adding this to the noxious weed list in November 2014. 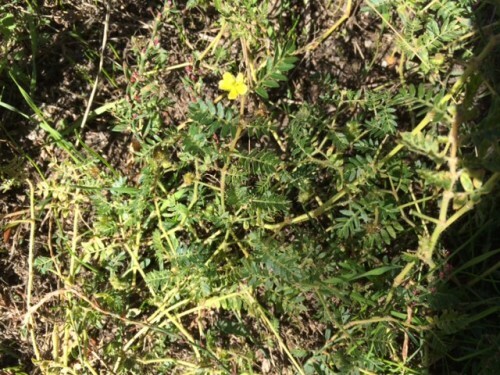 In Colorado, Puncturevine is on the Colorado Noxious Weed List as a Class C noxious weed. This means that local communities can get help developing a weed control plan.